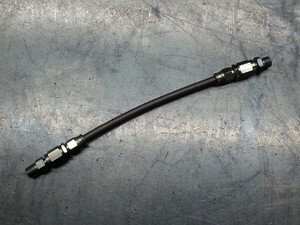 This adaptor hose takes the aggravation out of connecting the oil pressure gauge hose to the block where Marina or Ital blocks have been used. The block mounted upside-down oil filter makes access to the oil pressure hose monumentally difficult. This adaptor screws in to the block take-off port, the outer end of which is eminently accessible with the engine in the car.